The City of Sandy Springs received a number of briefings from GDOT this week at their annual retreat and their discussion on the express lanes went into depth on the issues surrounding GA-400 but there was a small map on page 17 that showed the entire structure of the express lane system and they identified Cottilion at Shallowford as a possible Westbound entrance & exit and Savoy as a possible Southbound entrance & exit? The photo above shows the two green & white dots and I'm sure it will be a discussion item at a future meeting. For example, a driver who lives near Holcomb Bridge & Spalding wanting a fast ride to the Cumberland area will now snake through Dunwoody on arterial streets to get to the Shallowford / Cotillion entrance instead of possibly going straight south to Peachtree Industrial to 285 on wider capacity thoroughfares. Not sure how the Flowers Rd or New Peachtree express lane entrances in Doraville would work for our community therefore they may relieve the pressure to use the Dunwoody entrances but what might help thosands of drivers would be additional toll express lane entrances on Peachtree Industrial whereby you get on at Winters Chapel and it ties you directly into 285 thereby eliminating the backups at that junction. Unfortunately I don't see those options. 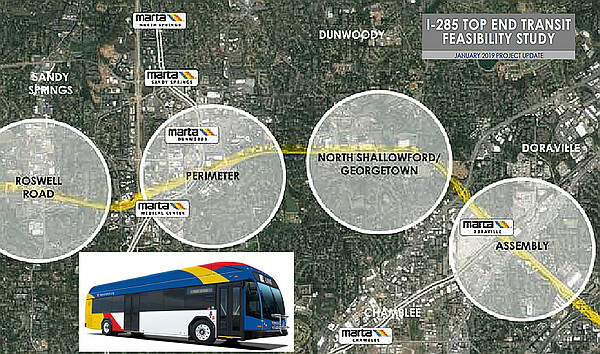 Other discussions that happened at the Sandy Springs meeting and will probabbly also happen at the Dunwoody retereat in February was the idea of Bus Rapid Transit along the top end and possible Marta improvements up 400.
page 17 of which document? I'm having trouble finding information that makes sense to me. It looks like the 'express lane' are elevated above the ground. Can anyone use them? are they free? Are they just new entrances/exits for 285? or are they more like a separate highway, and they'll have some areas where one can enter/leave from and to 285?? I think concur that an entrance at N. Shallowford could lure considerably more traffic down Winters Chapel/Happy Hollow/Peeler, and I would not want this. I have posted on GDOT website that I'd like them to widen and lengthen the merge area from Chamblee Dunwoody onto 285 West, which would facilitate funneling cars onto 285. Ideally, the experts on this topic would post a good youtube where they full explain these lanes, provide renderings, explanations, etc.